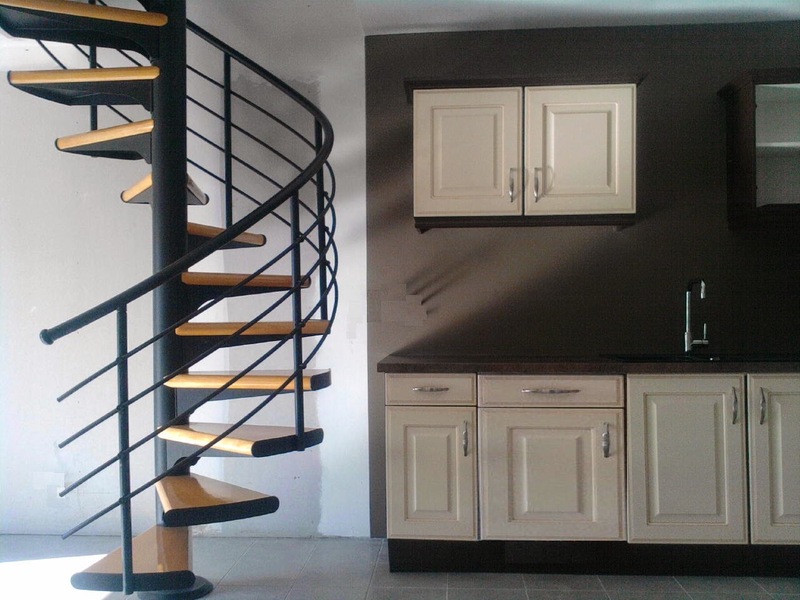 Spiral staircases, narrow stairs, built-in shelves - to save space in a small room go up different options. Models of compact stairs interesting, original and functional, although there may be dangerous. 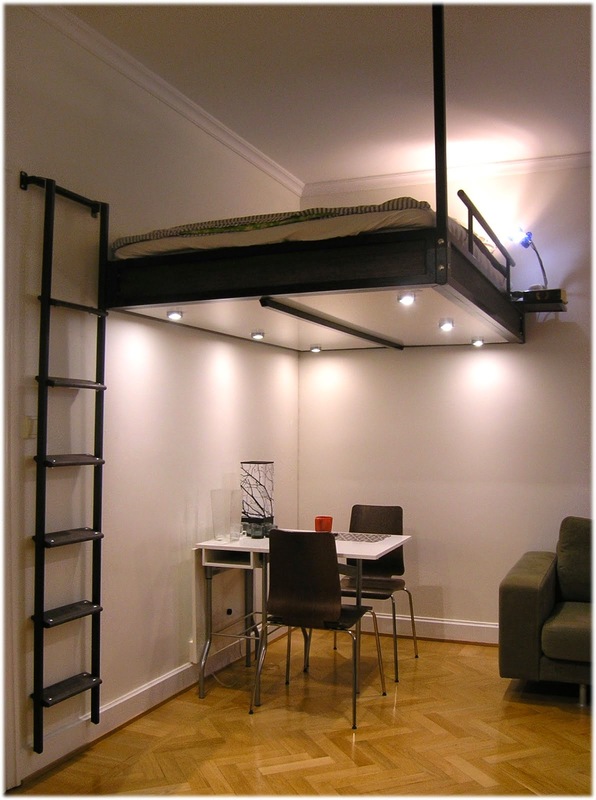 suspend loft bed and staircase "two in one" : Creating the second floor by a suspension bed and wall stairs is possible only if there is a high ceiling. 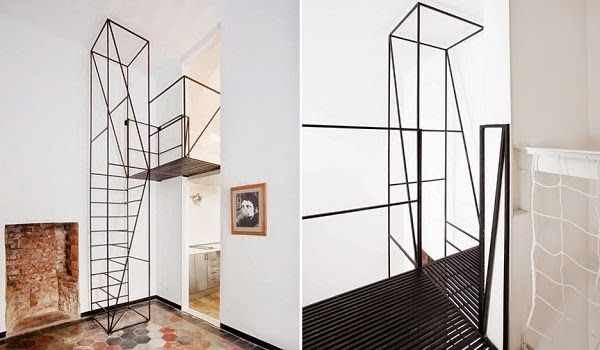 Designer Francisco Librizzi added modern simple metal staircase in an ordinary house, built in 1900 in France. Staircase takes up little space in the room and not very noticeable. Besides its versatile neutral form suitable for any decor. 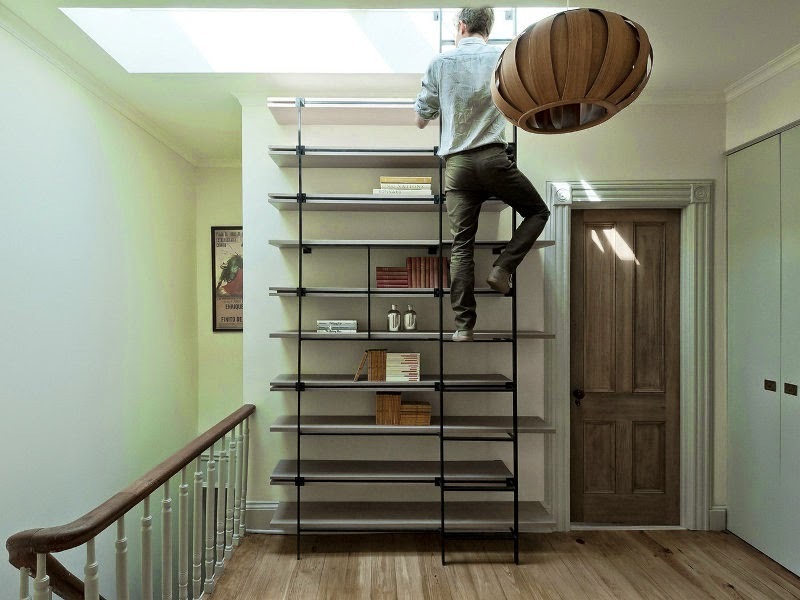 Simple ladder in Belgian mini house takes up very little space in the house due to its compact and small rotations platforms. The only drawback is the lack of handrails, which means that it is unsafe. In the U.S : inspection not allowed these stairs . The ideal solution for a small room. Stairs from Brooklyn connected to the bookcase and looks very inconspicuous and compact. 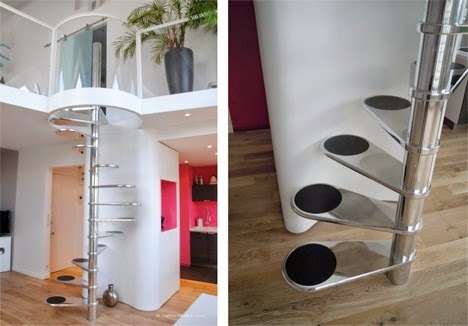 stairs designs are very compact, but unfortunately they are only available for industrial use. Steps are very narrow, and for such a ladder is very difficult to turn. Therefore, they are not suitable for children and the elderly. In addition, the handrails do not meet the requirements of stairs to residential use, as in this model no balusters. Original wooden stairs connects the loft bed in the form of a platform and a dining room. 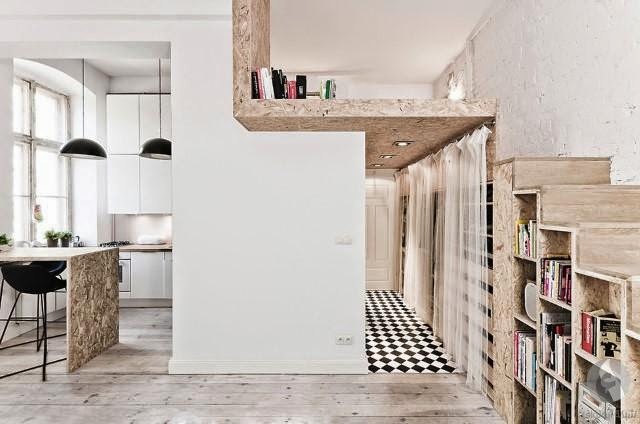 For a small apartment of 28 square meters, but with a high ceiling (4 meters), this decision was a very lucky find. 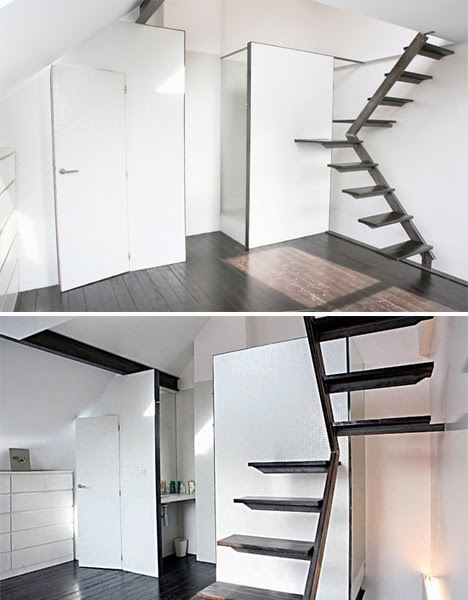 Compact stairs - it is not only a way to climb to the second floor, but also a place to store books. Compact, convenient and functional! 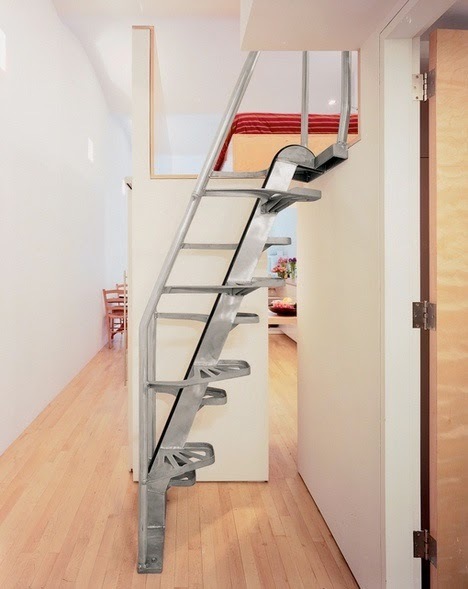 stair design-style 60 s, developed by designer Delphine Maumot, housed in a two-floor apartment in France. black metal staircase from Metal works looks very unusual and original, giving the room a modern industrial look. In many models, the use of the space under the stairs steps are foreseen. Therefore, this place is always a lot of dust and dirt from shoes. 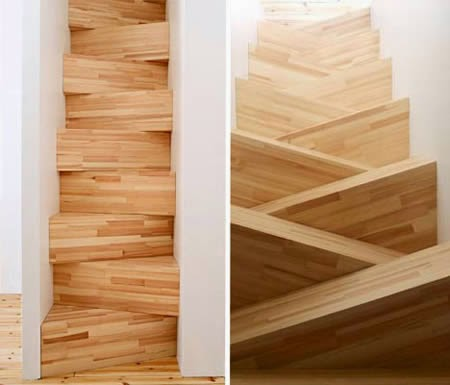 The design of this stair is very well thought out. The space under the steps used in the form of shelves for storage and books. In a tiny city apartment can accommodate a bedroom, kitchen and many more things. It's very simple. 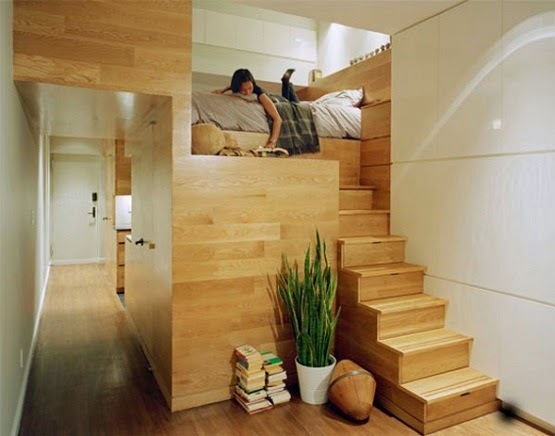 You need to separate the zone by using the second floor (or rather the bed-loft), and make a stairs drawers. 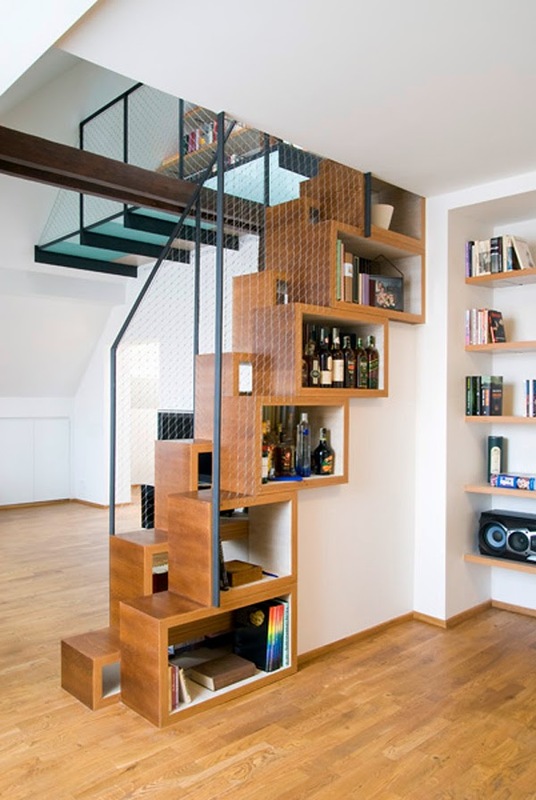 Probably, this staircase - not the most convenient way to raise the loft, but it is very convenient for storage. Things can be placed on the level of frequency of use. Things that are rarely used, it is advisable to place on the upper shelves. 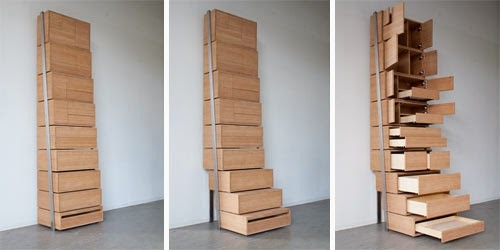 Swedish designers have developed an interesting model of the stairs that looks like wooden boxes, placed diagonally. Very convenient way to save space in the room. Model Karina Space-Saving Staircase considered the most simple and cheap, but it's also very convenient and compact stairs. Its universal stair design fits any decor.